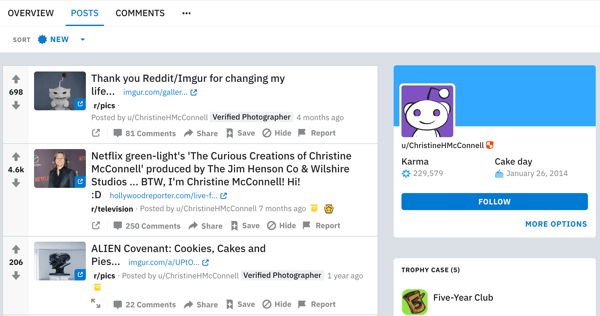 In this article, you’ll learn how to market your business on Reddit. We look at the big platforms—Facebook, Twitter, Instagram, LinkedIn, and maybe Pinterest—and view those silos as the only options for social media marketing. Yes, a huge amount of social media activity happens there, but the internet is a big place full of highly social niche communities that might be relevant to the customers you’re trying to serve. Reddit is one of the largest and most underutilized social media marketing platforms. As of this writing, Reddit is ranked the #6 most visited website in the United States (#17 globally), with an average daily user time of 11:29 compared to Facebook’s 9:34, according to Alexa.com. While it may not beat Facebook in daily traffic, it’s currently ahead of both Twitter and LinkedIn. Reddit is big. Reddit is active. And you’re probably not marketing there. Here’s how you change that. Reddit bills itself as the “front page of the internet” because its primary focus is on social news aggregation. Though the communities that have established themselves on Reddit often use the site as a sort of internet forum, the core functionality of Reddit is that users submit content and then others upvote or downvote that content. The most popular threads rise to the top. Reddit as a whole is carved into thousands of individual communities organized around topics or interests. For example, r/politics focuses on worldwide political news and r/dogberg focuses exclusively on footage of dogs haphazardly knocking over people or things. Where Twitter users follow individual accounts to tailor what kind of content appears in their feed, Redditors subscribe to the communities of their choice. Because of this voting system, opening the Reddit homepage is like getting a snapshot of the internet’s most popular content. If you have an account, your own front page is tailored to the communities and topics you care about. From there, users upvote, downvote, carry on discussions, argue, and answer each other’s questions. Redditors have the freedom to participate in virtually any way they want, from treating the platform like a news feed to being active participants who submit topics. It should be exciting to social media marketers who love the idea of talking with potential customers and sharing original, high-value content. 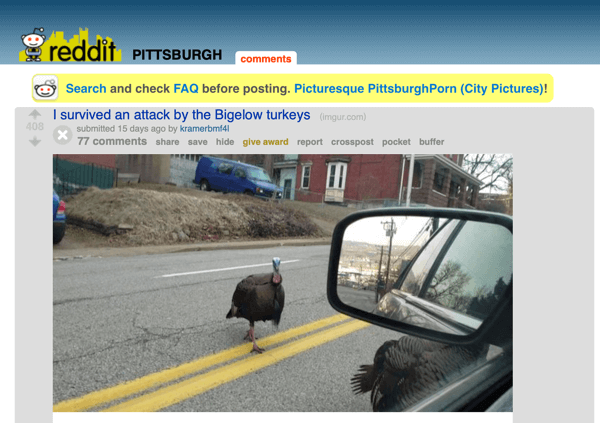 After all, Redditors self-organize by interest as well as location, with community subreddits like r/Pittsburgh becoming hubs for news and local discussions. 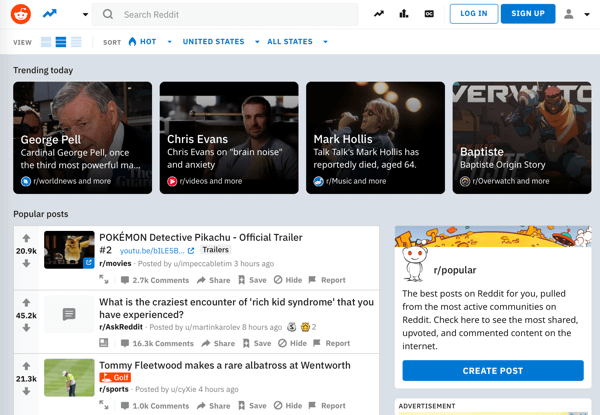 Reddit appears at first glance as if you can dive right into marketing to your target prospects. That’s not quite true, however; and this is where Reddit eats social media marketers alive. Redditors are fiercely protective of the communities they’ve built and loathe individuals or brands that attempt to hijack a subreddit for personal gain. Marketers who get it wrong approach Reddit like posting to Craigslist, and give little thought to the values and priorities of the audience they’re engaging. In the real world, this would be the equivalent of walking into a Magic: the Gathering event at your local comic book store and yelling about how great your t-shirts are. The people in Reddit communities have come together for specific reasons—hobbies, social causes, or just plain fun—and you have to genuinely respect that if you want to find success on this social platform. Be a member first. Few people trust a brand-new user account with no posts save for the ones made to promote products or services. Be a genuine participant before you start marketing and immerse yourself in how things work, from comment threads to inside jokes. Give more than you take. Most Reddit communities ask that you contribute 80% of the time and only self-promote 20% of the time. Depending on your content and your target community, that ratio can go up or down. Post original content and engage in a genuine way. You won’t find marketing success on Reddit if you repurpose your daily Facebook post and dump it into a subreddit. If you can become a valuable, contributing member of the community, however, you can unlock a new stream of fans for your brand. Don’t even think about using shills. Fake accounts, undisclosed paid sponsors, employee upvoting requirements—Redditors have seen it all, and it makes them very angry when marketers try to pull one over on them. While these norms are universal (for the most part) across the Reddit platform, you also need to understand that your target communities may have cultures of their own. If you’re a member first and take a sincere interest in the community you seek to engage, that won’t be a problem. 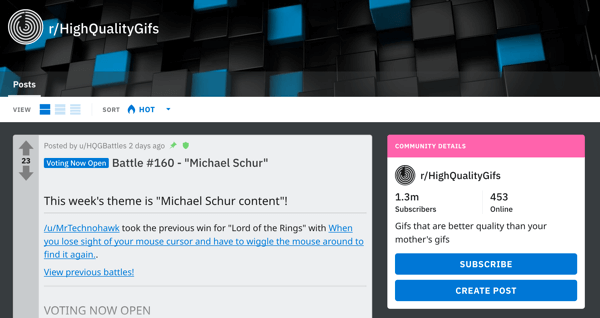 You’ll pick up on the traditions and mannerisms of the subreddit with relative ease, discover what kind of content gets the most interest, and learn how to title and format your content for maximum effect. You’ll also pick up on the sometimes-unspoken rules of the subreddit. 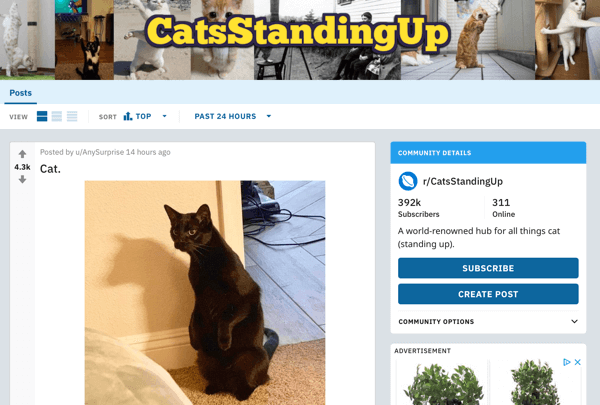 To illustrate, r/CatsStandingUp only permits pictures of cats standing up. Over 300,000 subscribers to this community only submit content with the title “Cat.” and post replies with the text “Cat.” That’s it. I don’t know why, but that’s how it is. If you enter that community and do something different, you’ll get downvoted out of viewing range almost instantly. I emphasize all of these oddities because Redditors are quick to ignore or remove obvious outsiders. They place a premium on the quality of their content and the sanctity of their communities. They know that if they’re not diligent about moderating and maintaining community standards, their beloved corner of the internet could be overrun by people who only want to sell things. 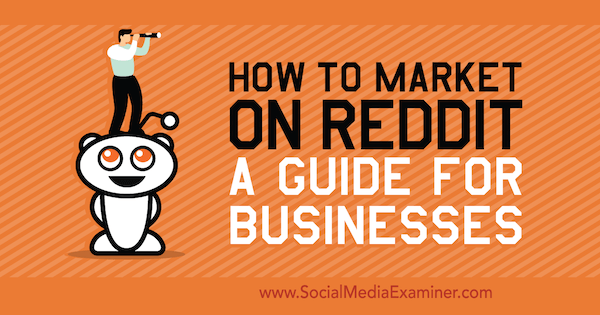 To start marketing your business on Reddit, it’s helpful to follow this roadmap. First, you’ll need to register for a Reddit account. Consider picking a username that includes a brand keyword as well as a personal name. If you can attach a real person to your marketing activity, everything will feel more authentic. 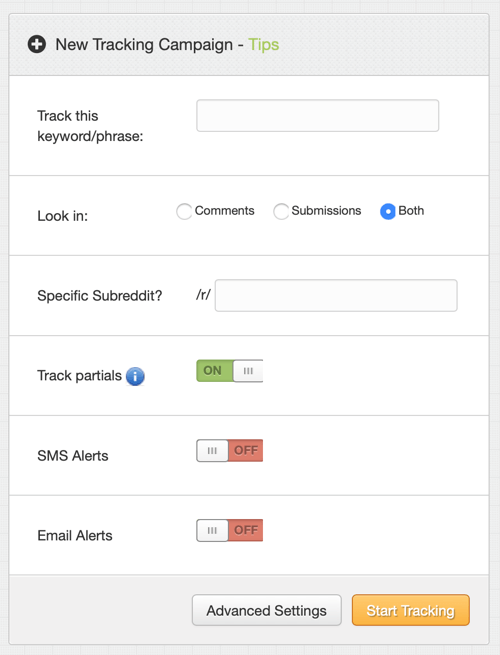 TrackReddit (with free and premium features) can send you alerts when your chosen keywords or phrases are used on Reddit. 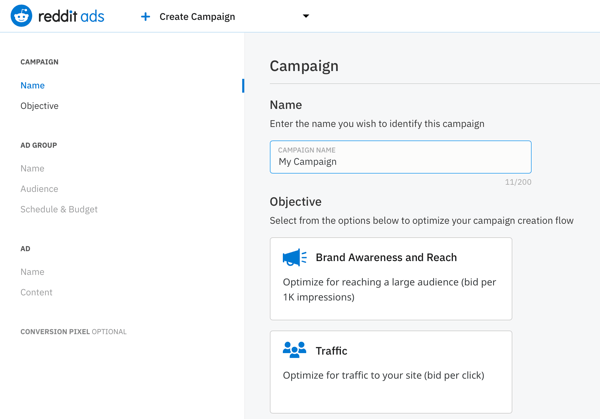 This allows you to quickly jump in when users mention your brand and also to engage in conversations around the exact topics or product types that are important to you. Go digging for all of the subreddits that might be relevant to your brand. The default front page is a good place to start. Then to uncover smaller, more niche communities, look at the recommended communities within a subreddit sidebar and do a Google search for “Reddit + [industry keywords]” (swapping in the topics or keywords that matter to you). Check in on Reddit daily and browse your feed and view discussions. Start upvoting and adding comments where you can contribute. Get a sense of what kinds of content your target communities find engaging and the general average time when top posts are submitted. Before you start submitting original content, adopt a regular commenting cadence. No, this is not like an exercise program where you get your 10 comments in a day. You have to actually contribute, taking the time to engage in discussions, answer questions, and share in jokes. Create a piece of content solely for your target Reddit audience (the next section covers what types of content are popular on Reddit), but don’t be upset if it doesn’t get a lot of attention. Just as every Facebook post doesn’t go viral, not every Reddit contribution will become a mega-hit. If you get a few positive comments and a few upvotes, that’s a start. Keep at your Reddit activity. No social media platform is an instant ATM machine of ROI, and Reddit is no different. Play the long game and continue being an active, worthwhile contributor to the community. 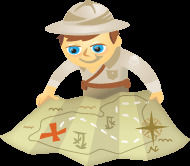 Once you get through the roadmap above, the next questions brands typically have are related to frequency and volume. Unfortunately, there’s no perfect answer here. Some subreddits are larger and more active than others. Some subreddits expect more or less original content from users than others. Remember: Using Reddit as a marketing platform is advanced organic marketing, so you need to tap into your marketing experience to figure out the best plan of attack for your chosen audience. Reddit can be a home for virtually any type of digital content, and that includes new types of content you might not have thought of yet. Basically, if you can link to it, it might find an audience on Reddit. There is, however, a set of content types that tend to get the most engagement on Reddit. I’ve put these types in a rough order based on their potential for engagement, but what works for your brand may be different. Remember that original content—in general—beats everything else. Here are the types of content that tend to get the most engagement on Reddit. 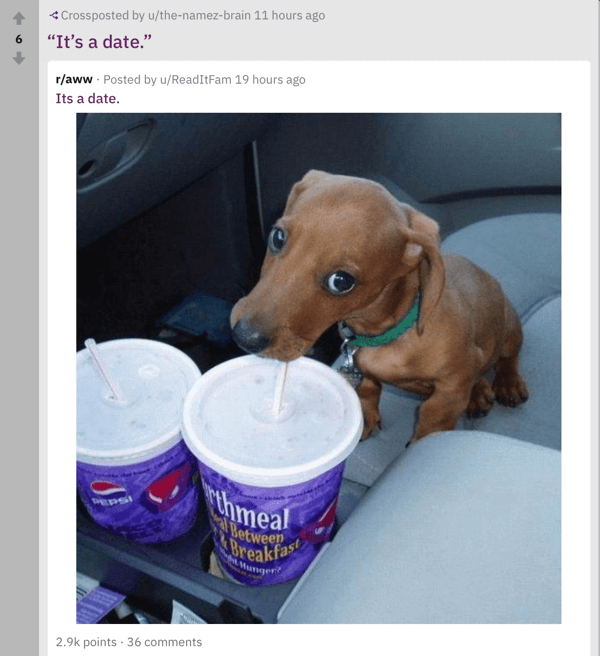 Reddit loves GIFs, including sports, events, movie scenes, animations, cute animals, and redubbing scenes from pop culture with inside Reddit jokes. GIFs are the bite-sized versions of video, and if your brand features any sort of action, you might find success with a GIF. In general, linking out to platforms like YouTube or Vimeo will yield relatively low engagement. Videos can take too long to load, and that level of upfront commitment isn’t a good fit for many communities. To be clear, this isn’t true for all subreddits, so your mileage may vary, but if you can pull the best part of a video into a GIF and then link to the full source in the comments, you’ll likely see more engagement. Still images are mobile-friendly and require very little attention for initial engagement. Again, the image needs to be interesting and if you can find a way to include a cat or dog, you’re ahead of the game. Many subreddits thrive almost exclusively on text-based posts and discussions. That can sound counterintuitive in the mobile age, but many Redditors love in-depth content and thought-provoking discussions, making text their preferred format. On the whole, Redditors have a strong distaste for blog spam. To be the exception, you need to be incredibly active in the subreddits where you choose to share blog posts. You should be extra-sure that the content is spectacular and that your execution of the content doesn’t come across as self-serving. If you feel like you have a blog-length piece of content worth sharing, consider making it a text post on Reddit instead of linking out to your site. 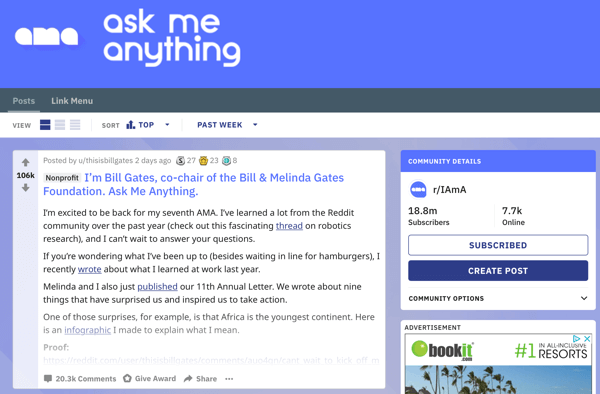 AMA stands for “ask me anything,” and these threads invite Redditors to ask a person any question they want. People or brands with unique stories to tell or who have a large reputation find a lot of success with AMAs. AMAs often take place in the subreddit r/IAmA, but interest-focused subreddits also frequently host AMAs. Some of the most legendary AMAs include one with Dr. Jane Goodall and some guy who used to play Goofy at Disney World. If you try this approach, you have to embrace the AMA concept for better or worse, so go in with a thick skin. The speed of the internet makes Reddit a powerful hub for breaking news. In communities tied to timely updates (politics, video games, movies, etc. ), sharing a piece of news can make you a hit. Sometimes this news is a fresh tweet from a thought leader or the first article on what could become a major issue for a community. The Reddit ad platform is a bit of an ugly duckling at the moment. While businesses have found considerable success with it in the past, Reddit has tooled and retooled their ad platform several times over the last few years, making it difficult to talk best practices or how an ad spend on Reddit compares to Google or Facebook advertising. Speaking in general terms, targeting ads by community has been productive for my clients, whereas broad, digital display-style ads seem to see low engagement. Remember: When you start to post original content, variety matters, so just because you get a win with GIFs doesn’t mean that you should only post GIFs. Serve your audience and serve them in multiple ways if you can. You want to sell things and I’ve just told you that Redditors aren’t fans of being sold to. Here’s the rub: Redditors gladly embrace brands that respect their communities and take an active role in making those communities better. They love original content. They love to laugh. They love to learn new things. And they love brands that take the time to get know them. I believe that when marketing is done right, customers and prospects benefit. My mindset is that good marketing seeks to serve an audience. Not only should marketing delight customers, but the very act of marketing should bring value to their lives as well. KFC recently ran a three-pronged Valentine’s Day campaign that featured a drawing, writing, and Photoshop contest. Across three threads, KFC accumulated approximately 900 comments and several dozen submissions. The winner in each category got some KFC swag, gift cards, and a Colonel Sanders bearskin rug (a white rug with the face, feet, and hands of the Colonel). 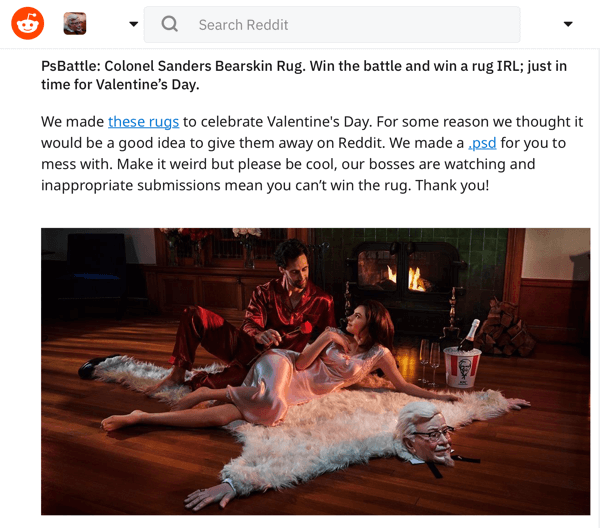 It was an awesomely weird campaign carefully targeted at some of Reddit’s most creative communities. Most importantly, KFC went in knowing that a few internet trolls were par for the course. The marketing team joked along with Redditors, even if that meant poking fun at themselves along the way, and the community produced a slew of original content around the KFC brand. They took the time to reply to comments and start the conversation by trying to add to a community (offering prizes that users would appreciate for using skills they’re proud of but might not get to show off as often as they’d like). When a major brand like KFC engages an audience on such a personal level, they can ingratiate themselves with Redditors and build up a treasure trove of highly shareable, highly memeable content. In this case, KFC used sponsored posts to skip to the front of the line for exposure, but Reddit marketing tactics work organically as well. 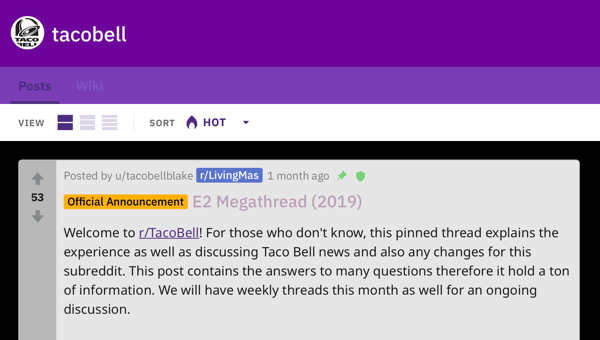 KFC’s sister brand, Taco Bell, has its own subreddit full of organic fan-submitted content. But you don’t need to be a major consumer brand to find wins on Reddit with organic content. Take Ryan Morrison, for instance. He’s a self-described video game attorney and posts under the username VideoGameAttorney on Reddit. 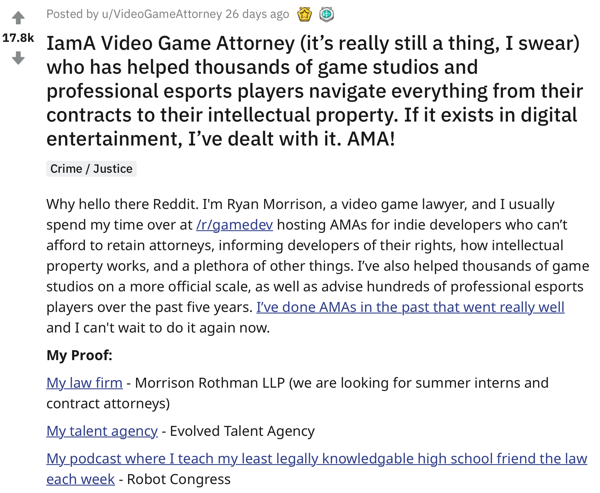 Morrison forged a reputation for going to game development subreddits, like r/gamedev, and offering free legal answers to aspiring developers with the expected disclaimer that it was for education and entertainment only, rather than any legally binding client relationship. He’s been doing these Q&A sessions on a consistent basis for several years, and his recent r/gamedev posts have averaged a few hundred comments apiece. 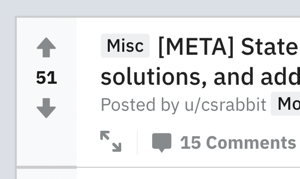 That’s pretty good, but his thread in r/IAmA (a subreddit where specialists or people with unique stories field questions from users) generated nearly 1,800 comments and over 15,000 upvotes. That’s a lot of engagement! Morrison’s approach to growing his business via Reddit is simple. He goes to the communities where he can be useful and offers up his insights. In reality, only a small percentage of Redditors will become his clients, but he’s built a reputation in the game development community because of his activity and his willingness to be a positive contributor to the audience he cares about. If you look carefully, you can find hundreds of brands and business leaders doing the same thing. They find communities that are relevant to them and make the effort to be positive contributors in those communities. Jason Calacanis, the prolific angel investor and host of the podcast This Week in Startups, comments and replies on threads related to entrepreneurship, startups, and investing. He even uses Reddit to field questions for his Q&A advice episodes. On the DIY crafting side, Christine McConnell built a following for her creative projects on Reddit (and Imgur), catching the attention of Netflix executives. Now she has her own show, The Curious Creations of Christine McConnell. Reddit is largely a blank canvas. Because its users respond positively to creative content, you can take the core pieces of what makes Reddit tick and find unique and new ways to leverage the platform. Where other social media platforms are built on the premise of centralizing a following around your account (your Facebook likes, Twitter followers, LinkedIn connections), Reddit’s community structure means that it will occupy a very different place in your broader strategy and a different kind of brand engagement. When I first start to talk to clients about how they can use Reddit, I tend to describe it as an extension of their public relations activity. It’s an opportunity to talk directly with your target audience, be a part of the communities that matter to your brand, and build real relationships with those communities. Viewed this way, Reddit is an outreach tool. It won’t replace the audience-building you do on traditional follower-based platforms, but it should open a new door for how you create and share original content related to your brand. What do you think? Are you considering Reddit as a marketing channel? What questions do you have? Share your thoughts in the comments below. Find out how to make your own GIFs. Discover three mobile apps to improve the quality of your photos. Learn how to create short, snackable videos for social media. Marshal Carper wrote this originally at Social Media Marketing | Social Media Examiner .